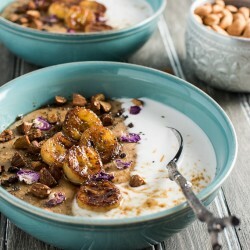 Whipped almond butter oatmeal with caramelized bananas is extra rich, creamy and full of healthy almond butter. 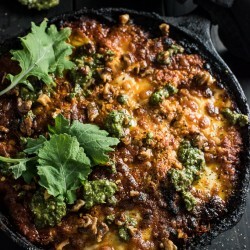 This healthy tuna casserole is every bit as delicious as the original version but much healthier. 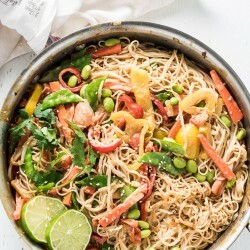 Creamy Coconut Peanut Noodles are the ultimate comfort food. 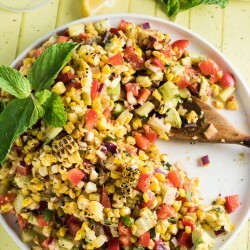 They’re also a super easy to make and a healthy vegan dinner! 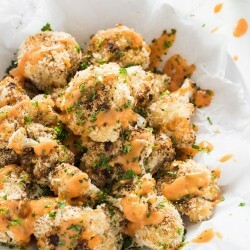 This super delicious Bang Bang Cauliflower is baked rather than fried for a skinny take on this famous recipe. 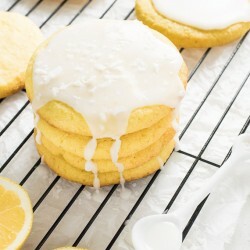 If you’re looking for the most delicious Lemon Sugar Cookies, this is your recipe. They’re soft and lemony with a light coconut flavour! 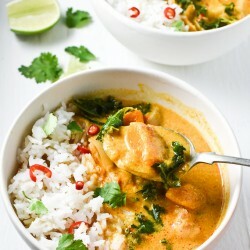 The creamy curry sauce is just as good as regular butter chicken sauce, and it’s loaded with tofu and veggies for an easy to make dinner! 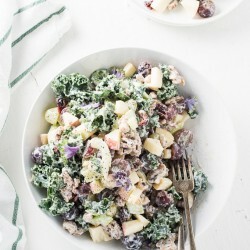 Kale Waldorf Salad is a much healthier, but just as delicious version of the original. It’s made with crisp apples, juicy grapes, and crunchy walnuts. 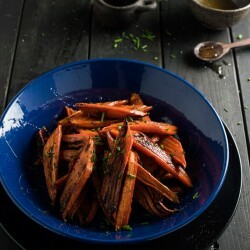 These honey roasted carrots are sweet and have just the right amount of spice from a pinch of cayenne powder. 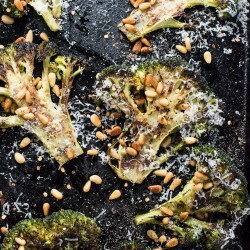 Roasted Broccoli Steaks are a delicious and healthy side dish topped with Butter Toasted Pine Nuts. So easy to make! 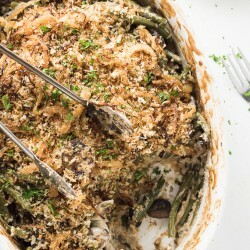 This vegan green bean casserole is made with a cashew-based mushroom sauce that is super creamy and delicious. 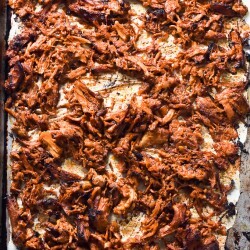 These simple and delicious crock pot pork carnitas are topped with an easy to make carrot slaw and some spicy yogurt. 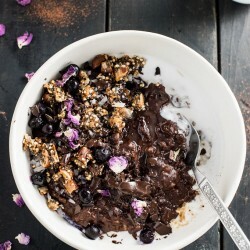 Triple Chocolate Oatmeal is a super decadent yet totally healthy breakfast. 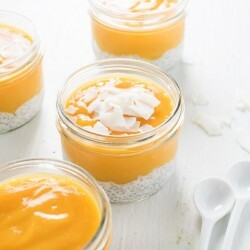 It’s made with coconut milk and topped with chia and nut clusters. You can make Sriracha Butter quickly and easily at home. 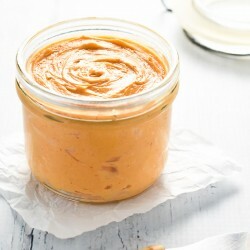 It’s delicious spread on a grilled cheese sandwich, on pasta or even on eggs. 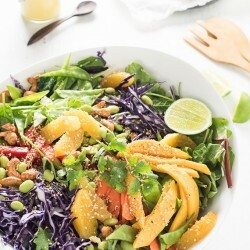 Turn this Thai Chopped Salad into a dinner salad by topping it with some thinly sliced steak or chicken, a piece of grilled fish or some crispy tofu. 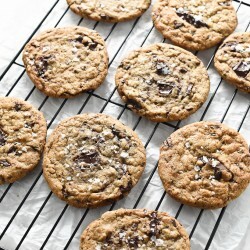 These Brown Butter Chocolate Chip Cookies have crispy edges, a soft inside and have the most delicious nutty, caramel flavour. 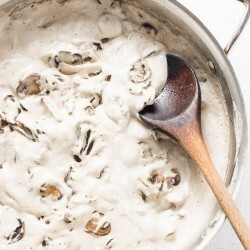 This mushroom sauce is pure magic. It tastes likes it has an entire container of whipping cream in it, yet it’s 100% dairy-free vegan. 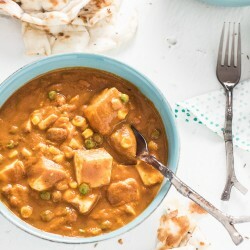 This vegetarian butter chicken poutine is made with easy to make butter chicken gravy, but no chicken. 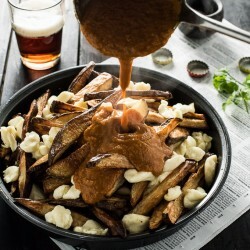 Baked fries + cheese curds + delicious gravy. 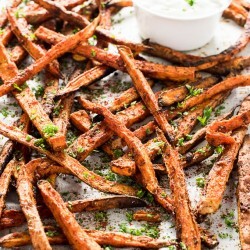 Sweet, smoky and slightly spicy Cajun Sweet Potato Fries make a super delicious and healthy side. 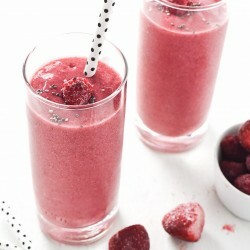 This bright pink chia berry smoothie is as sweet and delicious as it is pretty. It’s also vegan and dairy-free! 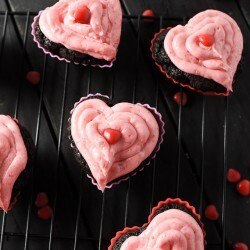 Warm someone’s heart with these delicious Dark Chocolate and Cinnamon Hearts Valentine’s Day Cupcakes on Valentine’s Day. 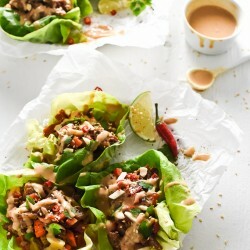 These healthy and delicious Thai Lettuce Wraps with Ginger Lime Satay are a breeze to make! Serve them with veggies or your choice of meat. 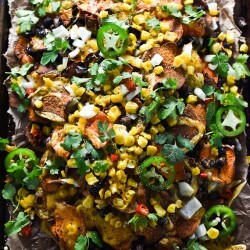 Sweet Potato Nachos are loaded with good for you toppings like corn, beans and avocado and are super delicious. 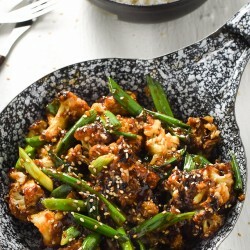 This baked General Tso’s Cauliflower is every bit as delicious as the fried version. 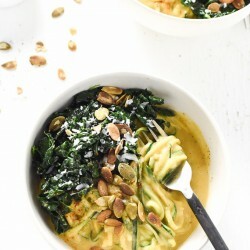 It’s easy to make and is a super delicious vegan and paleo meal. This delicious Healthy Pumpkin Alfredo is the best creamy comfort food ever. It also happens to be 100% vegan, paleo and gluten free. This easy to make Mexican Crock Pot Pork Carnitas recipe is super delicious and incredibly versatile. 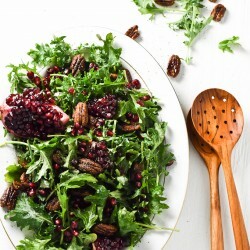 This baby kale salad is massaged until the kale is super tender then topped with pomegranate seeds and sweet and spicy pecans. 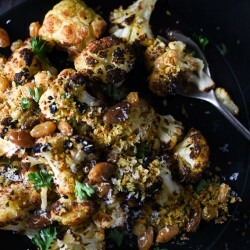 This blackened cauliflower is one of the best side dishes. 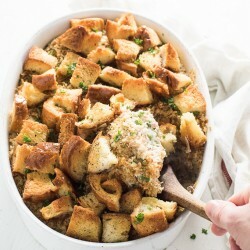 It’s roasted until it’s very dark then topped with crispy herbed panko and juicy raisins. 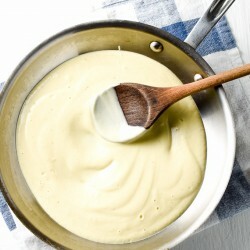 This rich, creamy and totally dreamy cauliflower alfredo is 100% dairy-free. 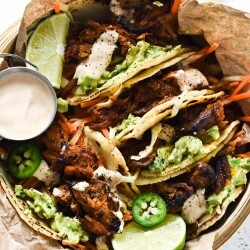 You’ll be amazed at how delicious vegan can be! Love smoothies? 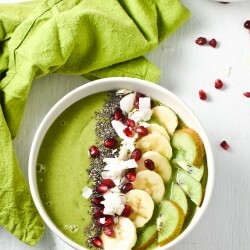 Then you’re going to love this smoothie bowl! It’s packed full of healthy fruits and veggies to start your day the right! 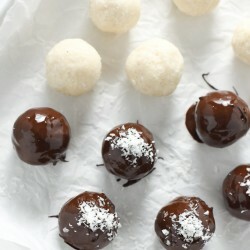 These Chocolate Coconut Bliss Balls are made with 100% healthy, good-for-you ingredients and are crazy delicious.